Come to the Tree. Pray to Die. Who can forget Elijah’s famous showdown with the prophets of Baal? This was probably the OK Corral of the Old Testament. Elijah went toe to toe with hundreds of false prophets and publicly humiliated them. They spent all day crying out and cutting themselves without so much as a peep from their god. One short prayer uttered by Elijah resulted in a plume of fire falling from heaven on the sacrifice he offered (1 Kings 18:20-40). Such pinnacles are rare. Anyone who ministers in any kind of capacity dreams of a moment like this. Many of us spend our lives seeking for God’s power to be so manifest. This was Elijah’s “15 minutes of fame.” He had arrived. But boy do those 15 minutes go quick. At minute 16, Jezebel put a hit out on Elijah (1 Kings 19:2). He freaked. He ran for his life. Faced with hundreds of false prophets, Elijah made smart remarks and prayed like a champ as the fire fell. Faced with his own death, Elijah turned tail and ran like any other man. Even though he was one of the few standing for the Lord in those days, he realized he was no better than the prophets of Baal, no better than his lukewarm countrymen, no better than the generations who failed to follow God before. When he stopped running, Elijah found himself under a broom tree, and there, he prayed to die: “I have had enough, LORD. Take my life; I am no better than my ancestors” (1 Kings 19:4). Then he fell asleep. 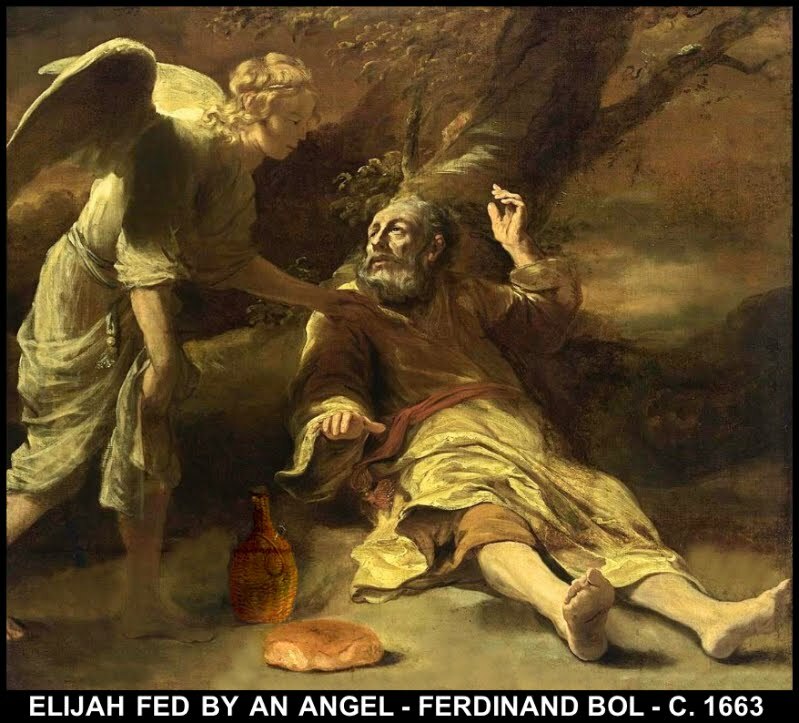 When Elijah woke, an angel served him bread and water (1 Kings 19:6-7). He ate, and scripture says, “Strengthened by that food, he traveled forty days and forty nights until he reached Horeb, the mountain of God” (1 Kings 19:8). Hopefully, we all have high-water marks as we walk with God. Hopefully, we all get to experience his miraculous power, as Elijah did when facing the prophets of Baal. But we need something more than miracles if we plan to go the distance. If we are honest, there are moments every day when our failings make it obvious we are no better than anyone else. Maybe we don’t fail as glaringly as Elijah. But even our little faults prove that we are flawed to our foundations, a product of our sinful ancestry. At these moments, we need to do what Elijah did: come to a tree and pray to die. “He himself bore our sins in his body on the tree, so that we might die to sins and live for righteousness; ‘by his wounds you have been healed’” (1 Peter 2:24). The cross is our tree, the place where God answers our prayer to die, where we can fall asleep and rest from our fallibility. At the tree we are free from the shame of our failures. At the tree our sinful nature—along with its passions and desires—is dead with Jesus (Gal. 5:24). The cross is also our tree of life, where sleepers rise, where Christ gives us the bread of His life (John 6:35). His life gives us the strength to get up when we fail and sustains us so we can keep walking with God. His life isn’t subject to the sinfulness of our ancestors. We are now descendants of One who has never sinned, and we are growing up in the freedom of that new lineage. No miracle or high point in ministry can do what Christ did when He died and rose again. We put a lot of energy into praying for miracles and seeking for manifestations of power. Perhaps our deeper need is for the Lord to bring us to the tree where we can know Christ in His death and resurrection (Php. 3:11). It seems for Elijah it was hard to bear the contrast of victory and the shame of running away, as it was for Peter, hard to bear the shame of denial, after swearing: I die for you. But Jesus didn’t bother about it. He healed Peter’s wounds, restored the relationship. He said, go on, take care of my flock. As He said to Elijah, go on, carry on, do what is there to be done. Do not bother so much about your shame! There is no bigger shame, than the shame of the Cross. There is no bigger looser, no bigger failure, than I was in the eyes of the world. They mock at you, they neglect you, they despise you, they hate you, because they don’t know you, because they don’t know me, because they don’t know the Father. This captures the essence, Teague. Very well said.